Toward Truth offers the reader a radical psychological guide to healing childhood trauma- both the extreme echelon of damage and the other 99% that flies below the radar and is considered normal. 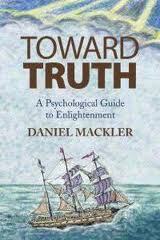 Daniel Mackler sides with the truth of the child, not the lies of the parents, and traces the roots of trauma in the family. Toward Truth takes the groundbreaking work of psychologist Alice Miller to the next level and in doing so offers a vision of deep, permanent, non-dissociative hope.